WP PhotoBlocks is the most useful plugin for artists and photographers who have in highest demand to create pixel perfect WP gallery in no time. Simple but powerful interface promises easy-to-use operation. Fast and easy galleries are to be created with a help of free customization features. Intuitive layout enables the user to keep control over how the images would be presented. If you choose a WP theme with a full-width layout, a photo wall page will be fully compatible. It is the most welcomed feature for the websites which are depending a lot on the image content. WP PhotoBlocks is empowered with responsive support just in case the user expresses special requests. In the demo version, PhotoBlocks creates gallery automatically from featured and custom posts by extracting the images. Categories and tags are a part of the default taxonomy you can use along with the custom taxonomy to select which posts to present. In this way images and posts are successfully linked. A general tendency is to make a website images more appealing towards the users and more dynamic. One way to accomplish that is to add a hover effect. A mouse arrow over the image changes some elements like shape, color, size etc. Usually, you can change the code in CSS by using a hover selector. The best advice would be to apply hover effects wisely on those elements you want to highlight. By increasing their interactivity, you can point one’s attention to the specific links. Remember that the excessive use of hover effects will have a contra effect. Instead of using them for navigation through a website, you better use them for the most important elements instead, in accordance with the principles of minimalism. If you are not sure about how it will look on your website, you can try out different creative and flexible options of WP PhotoBlocks until you find the best interactive design. WP PhotoBlocks is equally suitable for inexperienced and advanced users what makes it popular among designers and photographers. Yet, its use hasn’t been limited only on artistic endeavors. This plugin is ideal to create product showcase or any kind of album photo gallery. So far, it is mostly used for food presentations, weddings, travel, interior design, and tattoos. WP PhotoBlocks is time sparing, and it is possible to arrange vertical or horizontal images in the same gallery in only a couple of minutes. The gallery can include multiple rows and columns while a custom URL can be linked to each image. The drag and drop functionality is always the easiest way to add visual content to your website. Although there are many galleries available, grid builder is a popular feature which makes WP PhotoBlocks stand out. This handy builder enables designing the layout of the gallery by dragging and dropping images and spanning them over multiple columns and rows. To design a custom layout requires only minutes. The outstanding ease of use of this visual builder is complemented with a wide range of filters. Each gallery you create can be accompanied by a set of filters. The best is that the image is not limited to one filter. It can contain several filters in accordance with your needs. Portfolio galleries require to group images and to create subsets. WP PhotoBlocks is equipped with native support filters you can use to create your own special sets to be implemented to the images. 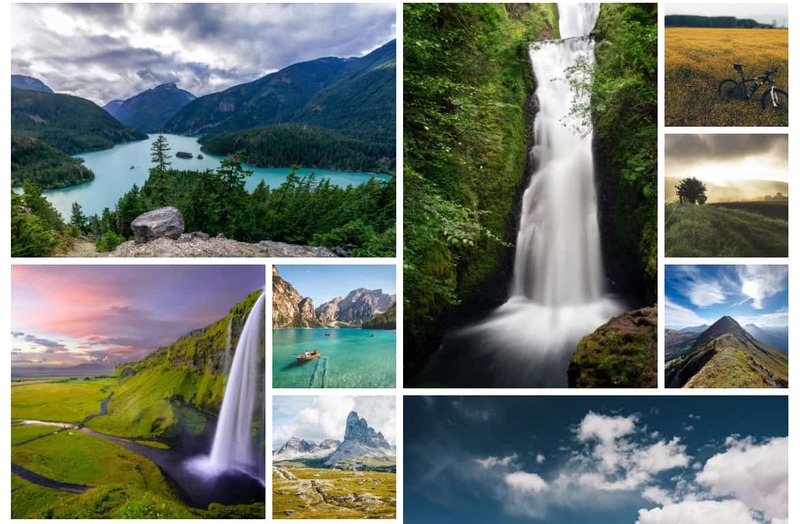 Besides key features such as drag and drop builder, filterable galleries, hover effects, and automatic galleries extracted from posts and custom taxonomy, WP PhotoBlocks offers pixel-perfect grids with justified borders in order to keep galleries clear and comprehensive. Justified edges also add to the overall appearance of the website. Thanks to a fast lightbox, each image can be zoomed. FancyBox is an option providing social sharing, hover and loading effects, thumbnails and optional image downloads. The list of WP PhotoBlocks unique features doesn’t end here. Title and descriptions are an important part of every image. Without them, it might be difficult to address the audience which considers image descriptions as additional information. It does matter how will you place the title since it must not disturb the image content. WP PhotoBlocks plugin offers you to choose among several top, middle or bottom title positions. You can follow your preferences or select what would match the image in the best way. Setting of a default position for the entire gallery or a custom position for each image is up to you. The same applies to the description position. A dropdown list contains different options. You can choose between the corner and centered positions on the top, in the middle or on the bottom of each image. User-friendly WP PhotoBlocks features also TextBlocks – special containers intended for the text. It functions like a WordPress grid gallery for image, text, and empty blocks. Text blocks provide additional information related to images while empty blocks preserve the distance between images or they can be a part of special layouts. 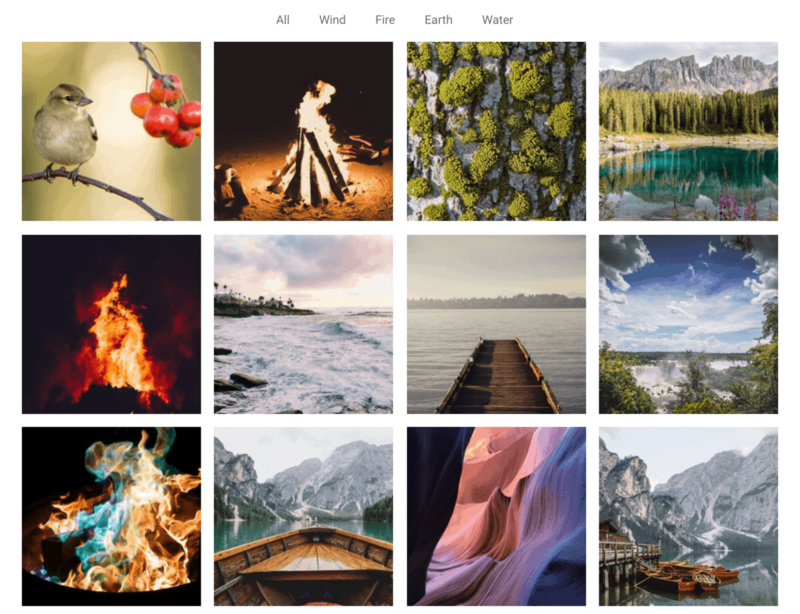 WP PhotoBlocks creates custom grid galleries. It means that the website will not be confined on predefined layouts (rows, squares, and columns) but you will be able to create any layout you want. In fact, you can start from scratch and draw the grid with a help of a drag and drop functionality. If you operate with different image shapes and sizes, you can combine landscape, portrait and square images to make a perfect design. Size of the margins applied between images affects the style of the website. Thinner or larger margin changes the appearance of a gallery. Before you make a decision, you can try out several sizes from 0 to 25 and get a visual of how it will look on the page. Social sharing is an important part of running a website. Boosting up traffic is hardly imaginable without this key feature. Sharing tools are available in a wide range of options, but in most cases, users have difficulties to find the icons. Their position varies, and sometimes they are missing. WP PhotoBlocks offers a gallery with up to 5 main social networks you can choose from. Among them, Pinterest and Houzz enable you to share the targeted image while other social networks use OpenGraph meta tags to share the set or a single image. WP video gallery for videos hosted by Vimeo and YouTube is also supported by WP PhotoBlocks plugin. WP PhotoBlocks is a highly responsive and mobile-ready plugin in accordance with the best practice of SEO. Quick access to videos and pages is enabled with a single click, and loading time is fast for full-width galleries as well. WP PhotoBlocks premium version features even faster loading and several options which are of great use. Premium features comprise filters/categories, text blocks, and additional hover and loading effects. Wide choice of additional caption layouts is also available in the premium version of the plugin as well as handling shortcodes inside blocks. To run the website professionally and to constantly move forward, you certainly have to keep these features on mind. WP PhotoBlocks is well known for its professional support which is available in both – free and premium version. Forms are precise, and they require specific information which is helpful in understanding the problem and speeding up the solving process. Normally, the problem has been solved within 3 business days. WordPress plugin collection takes pride in the visual builder PhotoBlocks plugin. This tool like no other helps you create grid galleries with minimum effort and only basic knowledge. Whether you are preparing your own portfolio, product showcase or an album, this plugin will help you create the mixed-media grid gallery in no time. Different sizes and aspect ratios remain pixel perfect, and you can also create the gallery of custom posts. Instead of leaning on the predefined layout solutions, you can think about creating the preferred layout completely in accordance with your needs. With such flexibility and freedom, you can achieve much better results. No wonder, WP PhotoBlocks is five stars rated by people who already use it. Mike is a freelance blogger and social media enthusiast, with a passion for online entrepreneurship and content marketing.